It’s 2.30am on a Friday morning and I’m at breaking point…. I’m exhausted, I’m in pain and I know that I’m only going to get a few hours of sleep before I need to be back in the kitchen ready to crack on with the rest of this weekends cakes. 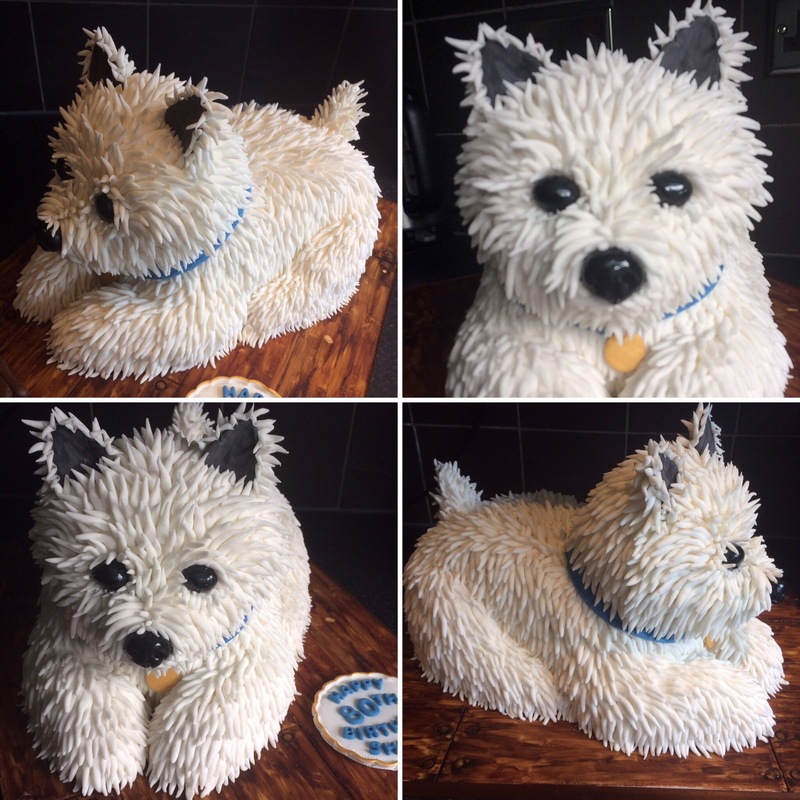 When the lady had asked me about the 3D Westie cake I wasn’t sure, could I really pull off something like that? I mean the picture she sent me was incredible, a cake that looked so realistic I’m not sure I would have cut it. In my nature I agreed, how hard could it be! Turned out the answer was very, of course our English Summer had to arrive that weekend which meant not only did I have the most complex order I’d ever taken but I also had melting buttercream, sticky fondant and mega dizziness to contend with. On Wednesday evening I piled up my square cakes and stared blankly with my bread knife in hand, I’d watched a few carving videos and they just hacked away with a bread knife and suddenly the pile of cake looked like a masterpiece, I didn’t have so much luck. The three weeks leading up to this had been hectic, I’d had a record number of orders and with the heat we’d had my various conditions were taking their toll. My legs were swollen and throbbing, the headaches were almost daily, my joints were crying, the brain fog had gone from funny to frightening and the fatigue was not going to give up. Still, I had orders to meet and people to please so with tears in my eyes I called Mum into the kitchen, she always has the answer and I really was feeling lost. Sure enough Mum came to my rescue, with a slice here and a cut there together we shaped my pile of cake into a rough dog shape and I began to feel a little calmer. I wrapped him in cling film and popped him in the fridge to firm up ready to decorate the next day. I had a four tiered wedding cake to complete for Saturday too so I covered all my boards and made my lace ready for those before heading to bed in the early hours of Thursday morning. I woke feeling heavy with anxiety, this is the day I have to finish THAT cake, I will settle for nothing but perfection … This has got to be perfect. I filled and crumb coated all my wedding cakes and faffed around basically putting off the inevitable, finally I ran out of other things to do and took the dog out the fridge. I filled his layers and put the base layer of icing on, he actually looked pretty cool and I was feeling relaxed until the heat of the day started kicking in and despite my fan he was beginning to feel somewhat soft under my touch. I had no option so I carried on, I started sticking his hair on piece by piece and I realised this was going to take way longer than I’d anticipated, I was beyond tired, my shoulders were burning and the flood gates were on the verge of opening. At 9.30pm by sister phoned to see how I was doing, those gates opened and she was met with my hysterical crying, ‘I can’t do this, he’s melting and it’s taking forever, I should never have taken this order I just can’t do it I should’ve known better’, I don’t often cry and I’m not usually negative so within 20 minutes she had come over and was sat beside me sticking his hair on too! We finished at 2.30am, he looked awesome but I was still petrified he had a day to survive in the heat before being collected for the party, for now though he would go in his box and I’d do the final touches in the morning before starting on the four ending cakes! I entered the house with caution, there he was on the table and to my relief he’d survived the night, there wasn’t a melted puddle in sight and I was so tired I shed a little tear over this fact. Onto the wedding cakes and although there was a slight worry over the melting issue at least I could get them covered and in their boxes fairly quickly. I’m incredibly lucky to have a Mum with a flower shop, basically it’s a massive fridge so I loaded up the van and took all the cakes there to finalise them in the cool. They were busy making the flower rings which would complete the wedding cake in situ and I was sticking edible lace onto my cakes, things were coming together and although I was far from calm I was beginning to feel a little more in control. Before we left I checked my Westie and to my horror his head looked as though it was beginning to sag! I began to shake from head to toe, that well known twisting in my stomach began and I honestly thought I may faint … His head can’t fall off, I’d dowelled it and done everything I should but this damn weather was set on ruining me. I made a support and propped his chin up, there was no other option and it could just come out before the cake was presented. Saturday morning came and the Westie was collected, she was blown away and totally understanding about the support, I was so pleased she loved it and now eagerly awaited a message to hear how the recipient reacted to it. Now to concentrate on the wedding cake and by now I was running on empty, my brain wouldn’t focus, my eyes were tired, the tremors were in full swing and every part of my body ached. The finish line was in sight but it was 34 degrees outside and I had a cake to get to Heathrow, a good hours drive away and in London slow moving traffic … Yep you guessed it the next panic attack was brewing! Once again my clever Mum came to my rescue, she told me to go and buy some foil survival body bags, I thought she’d gone mad to be honest but I put my faith in her and did as I was told stopping at home on my way back to pick up all our cool packs (I was amazed at how many she had squirrelled away considering we never use them!). I gave Mum everything and stood back confused at her next step, she unraveled one of the body bags and lay it down in the back of the van, I continued to follow orders and one by one put the four wedding cakes onto the foil sheet while she surrounded each one with ice packs, finally she folded the bag over the top of all the cakes and put a blanket on top to keep the whole thing sealed. This couldn’t possible work, could it? It flippin’ well did! I could have kissed her, I apprehensively opened the body bag and peeked into one of the boxes to see a cake in one piece just as it was when I put it in, I’ve never been more relieved in my entire life. We trudged up and down from the van to the function room with the four cakes and all the flowers too, I was exhausted and my poor Mum was struggling with a recent knee injury (I had told her to stay in the van but she kept pretending it was fine in true Mum style). 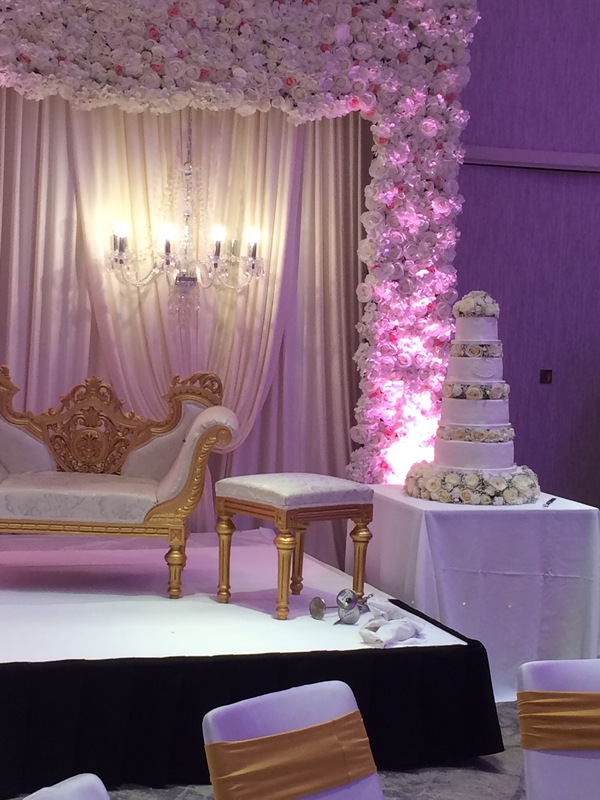 Finally the cake was installed, it looked beautiful and my orders were COMPLETE! I knew I wouldn’t totally relax until I heard both had survived until cutting but there was no more I could do and so we clambered back into the van and headed home. We made it home and I crashed, nothing would have got me up that night! I was beyond shattered and I knew it was going to take more than a few days to recover from the last few weeks, I was right it’s been almost three weeks and I’m still trying to get my energy back. The illnesses I have been dealt don’t seem to care that I’d like to lead a life but that’s ok because I still do and I will continue to do so, sure I haven’t been able to do much the last few weeks but I knew it would happen and I had prepared myself for that. I’ve been able to take Ashley for some rides and walked Roxy everyday and continue to do my afternoon job, I just don’t do much else inbetween!